For anyone who might be interested in how this website was put together, here is a brief summary. 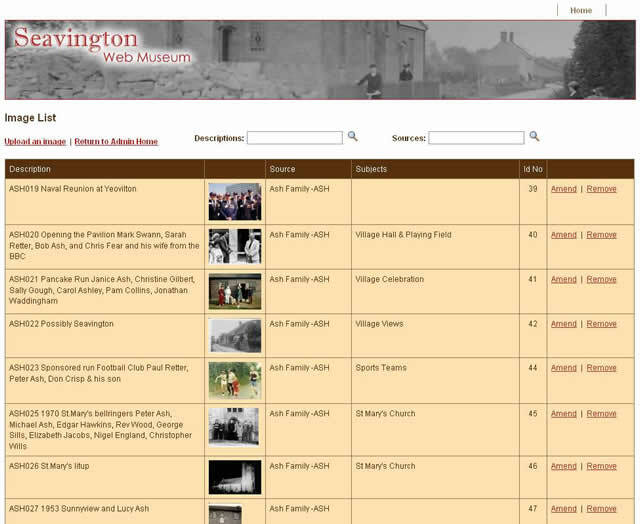 When Ry and Carolyn (the Curators) approached me with their idea for putting the Seavingtons’ history into a website, they stipulated that the most important thing was to have flexibility to grow the site in numerous directions, even if those directions were not necessarily known at the outset. In addition, they were not web technicians and it was vital that they were completely protected from the technicalities at all times. So the instruction was clear - make it flexible and make it user friendly. 1) The website would take the form of a museum rather than some sort of chronlogical history. 2) The museum would consist of galleries. Galleries would contain sub-galleries and they, in turn, could contain sub-sub-galleries and so on. The number of galleries and levels within galleries should not be limited. 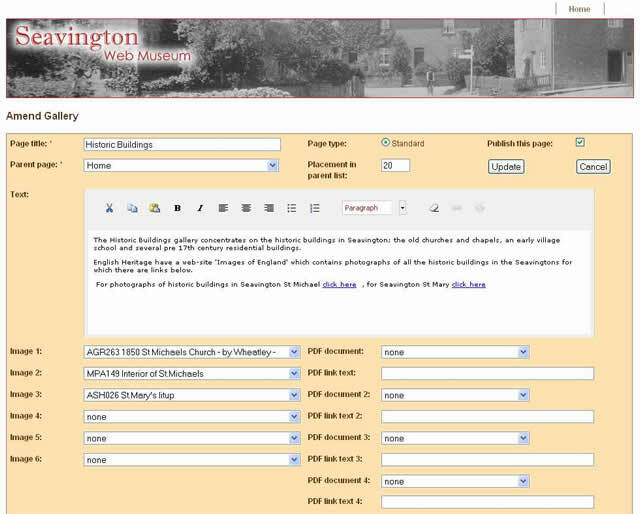 3) The galleries must be capable of storing and presenting information in a variety of formats (articles, records, pictures, PDF documents, audio narratives, extracts from The Seavingtons’ News, etc.). 4) Photographs and other documents would be a key component of the museum. The Curators had hundreds of pictures and the number was growing fast. So there had to be a mechanism for uploading, categorising, cross-referencing and displaying them. Again there should be no limitation on the structure or number of categories. 5) Visitor contribution and feedback would be important as this would give the webiste a more ‘collaborative’ feel rather than just presenting the information collated by the Curators. 6) In order to keep the site fresh, there should be a means of informing visitors of the latest developments and additions (“latest news”). My approach to building the website was to start by designing a database that would hold all the information - everything. Not just the facts and figures, but the structure of the galleries, the content of every page, the cross referencing of images, the feedback from visitors, the order in which information is presented and so on. This was the ‘flexibility’ bit. Then I created a series of forms that the Curators could use in get the information into the database. The idea was to shield them from concerns about colours, fonts, layouts, etc as all this would be handled by style sheets. The forms would validate the information as much as possible. This left the Curators free to concentrate of the content. This was the ‘user friendly’ bit. And finally I wrote a series of scripts that pulls all the information from the database and presents it in the pages that you are looking at now. The whole thing has evolved into quite a challenging project. Along the way I’ve learned a few new skills and developed some techniques that I’ve been able to use on other projects. I’m a web developer and database designer by definition, so the experience has been enjoyable and rewarding. But we haven’t finished yet. We continue to meet regularly (myself, Ry, Carolyn and Carolyn’s dogs) to plan the next stages. There’s plenty more information and functionality still to be added, so keep an eye on the “latest news” on the home page. 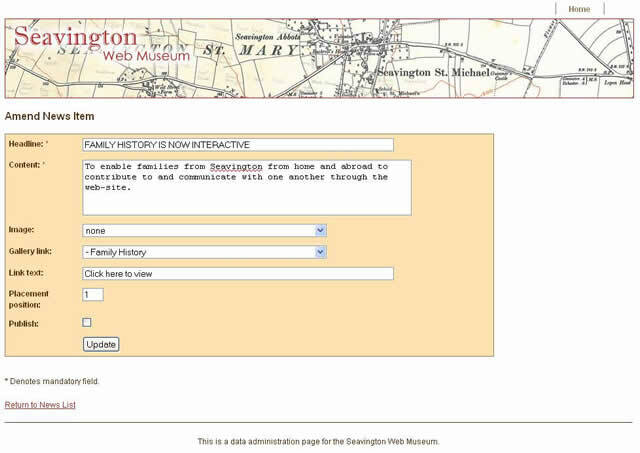 No images or text may be downloaded or reproduced from this website without prior permission from the Seavington Web Museum Curators.